Major misfire mockumentary is neither funny nor scary and entirely too long by at least 75 minutes. Supposedly cut from the tapes the unaired pilot for the show Haunted Hoarders the film relates the trouble that occurs when a bunch or hoarding experts tries to help a man with multiple dwellings pair down his pile of crap. As they proceed they realize that there is an evil presence haunting one of the locations. Ill conceived on pretty much every level THE HOARD is a mess. Played for laughs it gives us clowns not characters. Since everything is played for laughs there are no chills. Sticking to the TV show model the film never breaks character where it should to become something else. Personally I found so much wrong with the film I had to stop taking notes because I ran out of paper. To be honest the real problem with the film is that this should have been a 15 minute movie not a 90 minute one. At 15 minutes it could sustained the laugh/chill ratio. It also would not have pushed the internal logic and reality show jokes past the pint of breaking. As a feature its much too long- since the shows its riffing have episodes that are less than half the running time of this film and in my opinion even that is too long. 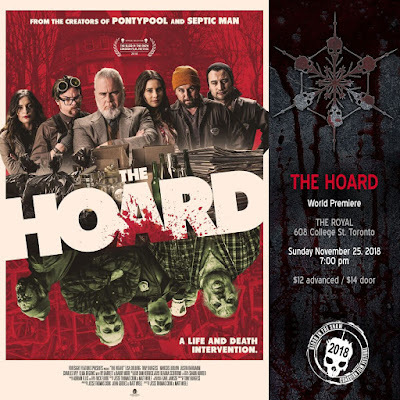 I really dislike this film, not just because it's a badly done film, but because I am saddened that the creators of PONTYPOOL, possibly one of the best horror films of the last 20 years, and the director of DEADSIGHT which is one of the best films at Blood in the Snow, were involved in this. Oh how the mighty have fallen. Not recommended, this is ending up on my worst of the year list.